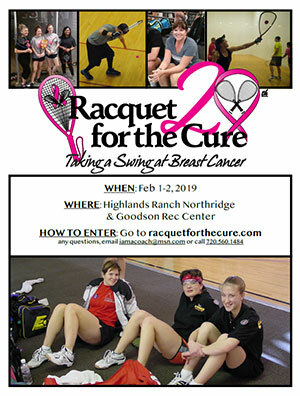 Played in three parts … The 2019 Racquet for the Cure invites you to join in for a MIXED Doubles Fundraiser on Friday evening, followed by exclusive, specialty TEAM play for WOMEN and a MEN’S DOUBLES Invitational Shootout on Saturday. At the close of play on Saturday, we’ll meet up to socialize and celebrate. Celebrating its landmark 20th year, this event has evolved while retaining its original purpose and goals of supporting and developing new women players in Colorado. The team format offers an exclusive opportunity for growth, learning and interaction between novice and veteran players, using the unique team format. On the fundraising side, the added doubles divisions welcome Colorado men to the cause of helping support the Denver affiliate of Komen for the Cure. With added courts available this year, limited Men's Singles divisions will also be offered. Just remember that your Sunday will remain free (! ), so sign up early to get into the mix, since the condensed timeframe and format fills up fast. Wear your pink and we’ll see you there!